The Curve Deformer distorts the element to follow an organic and fluid curve line. 1. In the Deformation toolbar, disable Setup Mode . If you leave Setup Mode on, you will modify the resting position of the deformer chain instead of animating it. 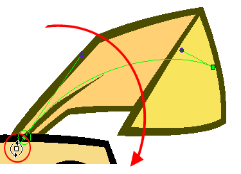 When Setup Mode is disabled, the default colour of the deformation control is light green. 2. In the Tools toolbar, if you want to create keyframes, enable the Animate mode. 3. In the Tools toolbar, select the Transform tool. 4. In the top level of the Network view,or press [Ctrl] + [A] (Windows/Linux) or [⌘] + [A] (Mac OS X) to select all the modules, you can also select Edit > Select All from the top menu. In the Camera View toolbar, select Show Control or press [Shift] + [F11]. This will display all the deformation controls in your scene. 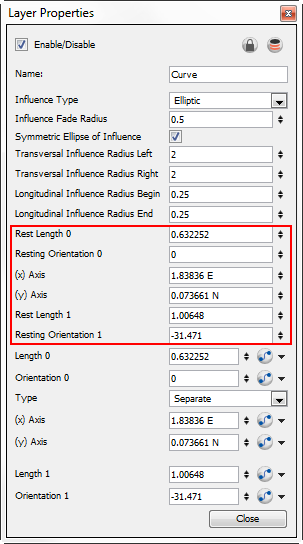 Refer to Displaying the Deformation Controlsto learn other control display option. 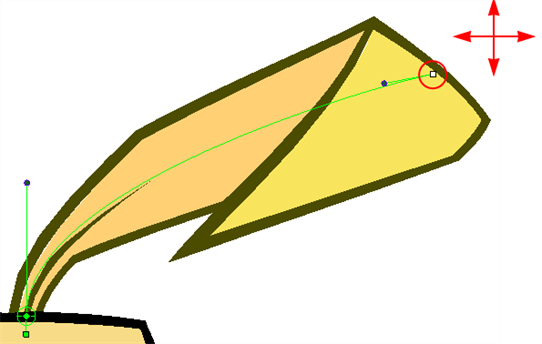 ‣ Click on the centre of the Deformation-Root pivot and drag it around to reposition the entire deformation chain. ‣ Use the pivot’s square handle to rotate the entire chain. 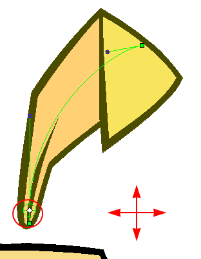 ‣ Use the square control point located at the extremity of the curve to stretch or shorten its length. 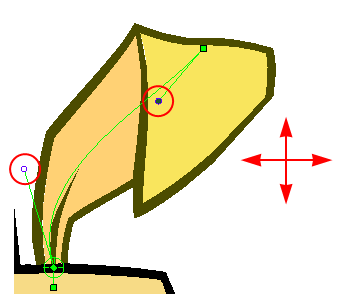 ‣ Use the curve handles to modify to shape of the curve. 6. If you have a chain of several curves, you can get all the children of a curve to follow the movement of one handle. This can prove useful when, for example, animating an arm and you do not want the fingers sticking to their original place while moving the wrist. ‣ Select the handle you want to move. The handle’s colour will turn white once it is selected. ‣ Press and hold the [Ctrl] (Windows/Linux) or [⌘] (Mac OS X) and move the handle. All the children will follow the movement. 7. If you have a double-sided handle, you can lock it, so only one side will move at a time. ‣ Select the handle you wish to move independently from the other. The handle’s colour will turn white once it is selected. ‣ Press and hold the [Alt] key and move the handle. You can also manipulate the deformers by typing values directly in the Layer Properties of the deformation effect modules.